Acai Berry increases your Energy! Acai Berry provides Sustained Energy! What can you eat that will give you sustained energy throughout the day? CAOH® Acai? Yes! What does this exotic fruit have that gives you sustained energy throughout the day? Carbohydrates and fiber. But not all carbohydrates give you sustained energy. Carbohydrates, when digested, release glucose, or sugar into our blood. The measure of the extent of the sugar rise caused after a food is eaten is called the Glycemic Index (or GI). The lower the GI of a food, the slower the food is digested and absorbed, producing a gradual rise in blood sugar levels. Foods such as white bread or jelly beans, when eaten, cause your blood sugar to rise very quickly. A blood sugar that is too high or too low is dangerous for our bodies. So when sugar rises, it stimulates the pancreas to release insulin into the blood. Insulin tells all our cells to open up their “gates” and let sugar in. This then causes the blood sugar level to drop again. When we consume foods that release sugar quickly, our bodies tend to release too much insulin. Too much insulin means that too much sugar is taken up by our cells, and causes our sugar level to drop to under normal levels. This is the low that you usually feel after a sugar “rush”. It does not give you sustained energy and tends to make you feel tired and fatigued. 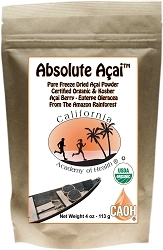 CAOH® Acai berry pulp has a glycemic load of 0.5. The glycemic load (GL) is a relatively new way to determine the impact of carbohydrate in our blood. It gives a fuller picture than GI alone, since it considers the amount of carbohydrate consumed. 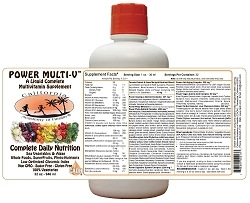 A GL of 10 or less is considered low, therefore helping control blood sugar levels. 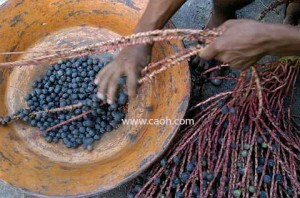 CAOH® Acai has a glycemic load of 0.5, meaning that it provides sustained energy for today’ss busy lifestyle. The dietary fiber in Acai acts like a sponge, mixes with all the digestive juices in our bodies binding to the good we have eaten, and helps to slow down digestion. Instead of getting a sugar rush after a meal, the sugar is released slowly, giving you sustained energy! This also helps control appetite and delays hunger, which may help in a diet program. Unlike most juices, most of the Acai berries kilo joules come not from sugar but from the healthy unsaturated omega-6 and omega-9 fats. This is one juice you can fell good about drinking! It will fill you up due to its fiber content and at the same time give you sustained energy, unlike other fruit juices! The Acai berry is usually mixed with apple juice, which has a low GI- to give you the same sustained energy as a CAOH® Acai smoothie. So next time that you are looking for a pick-me-up, look for CAOH® Acai at your local health food store. 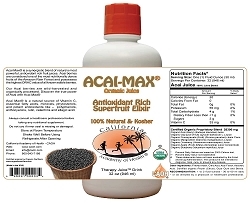 Get CAOH® Acai Berry Online Now!